Martin Killeen as seen in 1935 when he and his wife Mabel were guests at the wedding of Horace Tinkler and Elsie Dunsmore in Bottesford. Identified by grand-daughter Jean Rigby. 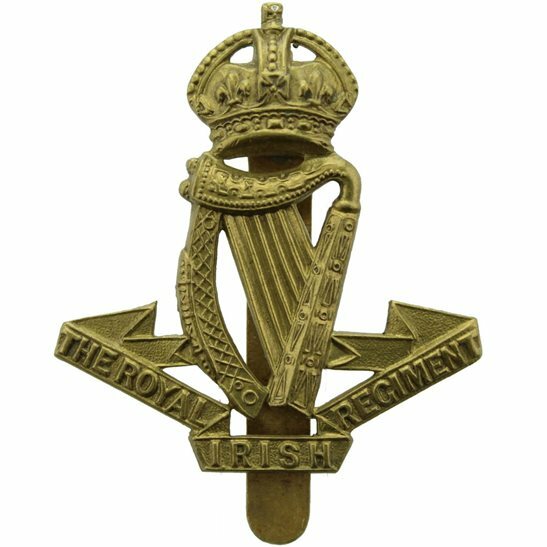 Martin Killeen’s military service record has not been discovered with certainty, but bearing his family origin in Mayo in mind, it seems likely that he served in one of the Irish regiments. Two medal index cards have been found that could be his. For the purpose of this record, the soldier with the Royal Irish Regiment is adopted, but this is by no means certain to be correct. Martin Patrick Killeen came from a place called Curroughaoe, Mayo, in the 1911 census. This place name was not been corroborated, but it is reasonable to propose that the census official mis-spelt Curraghdooey, which is near to the town of Claremorris in the east of Mayo, close to its border with Galway. On this basis it is suggested that he was a friend or acquaintance of Matthew Bane, who also came from near Claremorris and found his way to Muston where, like Martin, he worked as a cowman. In the 1911 census, a man named Martin Patrick Kelly was recorded as a cowman living and working on the farm of Henry and Ann Rebekah, called Goodson’s Farm, Muston. Martin was recorded as a 25 year old cowman. No other pre-WW1 records have been found. However, it is apparent from postwar information that he was in fact named Killeen, not Kelly. It must be admitted that there is as yet no certainty which, if either, of these applies to the man who had worked in Muston. In 1928, Martin Patrick Killeen married Mabel Tinkler in the Grantham district (which included Muston). In the 1939 register, at 13 Albert Terrace, Albert Street, Grantham, lived Martin P Killeen, a railway ganger born on the 28th March 1885, and his wife Mabel, born on the 16th August 1895, plus their three children. Martin Killeen died in Grantham in 1950, aged 65. “I was looking at the Bottesford History Page today Friday, 10th August 2018, when I noticed one of the photographs was of the wedding between Horace Tinkler and Elsie Dunsmore in 1935. I noticed my maternal grandparents Mabel and Martin (Patrick) Killeen were on this photograph. My Grandmother, Mabel, originated from the village and was a Tinkler before her marriage. I remember meeting her brothers Bernard and Jack and also her sister Frances. My mother’s name was Charlotte, or Lottie as she was normally called. I also remember my mother speaking of her Grandmother Marie, who I believe lived on Queen Street(?). What a total pleasure and a big surprise seeing my grandparents on this photograph. If anyone would be so kind as to let me have any further information on my family tree I would be very grateful. This is an unsubstantiated provisional identification.